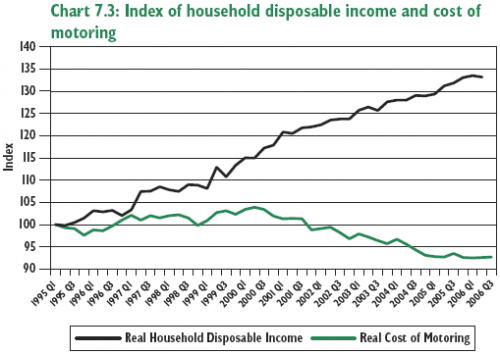 Other the past two decades, the real cost of motoring has fallen. 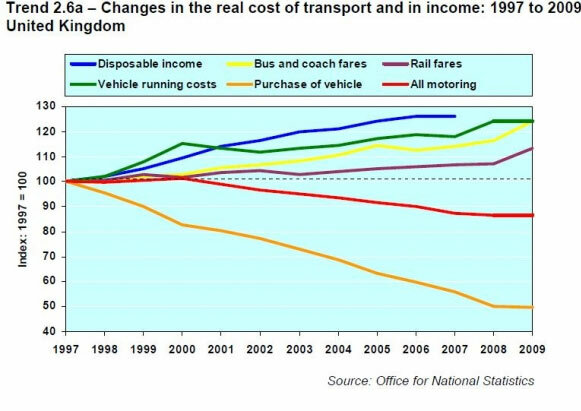 Despite increases in petrol tax, motoring is getting cheaper – whilst other forms of transport, bus and train have been increasing faster than inflation. With the political popularity of freezing petrol tax, we are likely to see motoring continue to be relatively cheaper. But, although cheaper motoring seems attractive, the drawback is that it will contribute to a marked rise in congestion and very different costs to motorists and society. Even a study by the RAC also shows that the real cost of motoring has fallen. – Even though you frequently hear about hard pressed motorists. Cost of travel since 1988. Spot the hard pressed motorist. However, motorists do pay £45bn in fuel duty, VAT, new car tax and the road fund licence. This letter to the Manchester Evening News, puts it quite well. Not too much to add. But, always good to see a bit of un-emotional common sense. Deserves to be shared because it can make a big difference in reducing unnecessary stress, anger and accidents on the road. 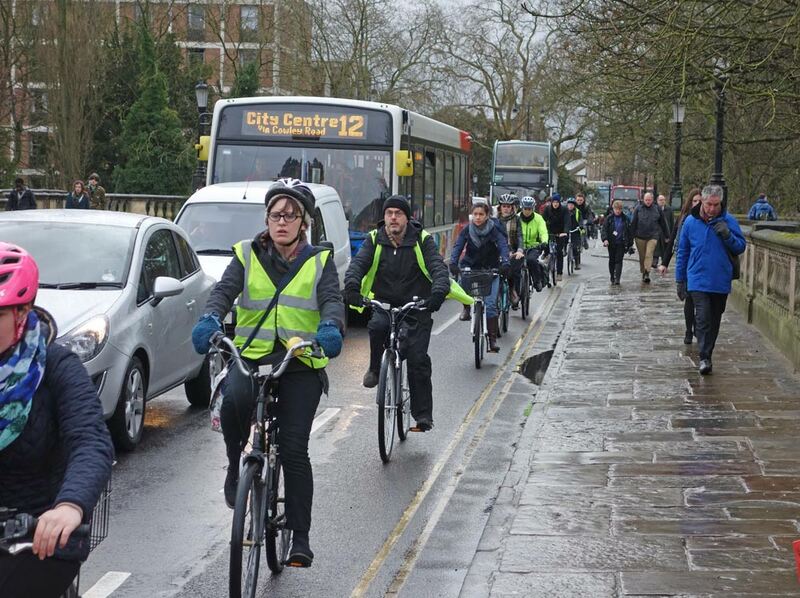 Congestion in Oxford encourages people to take an alternative. Cycling into the centre is significantly quicker at rush hour. 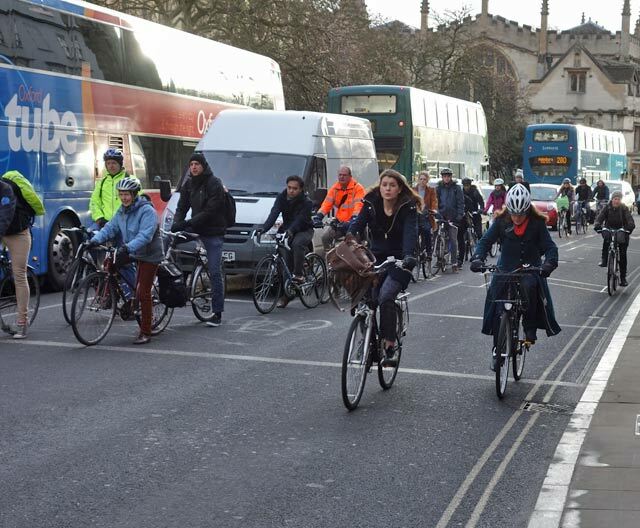 Will the forecast increase in congestion lead to a rise in cycling rates in the UK? 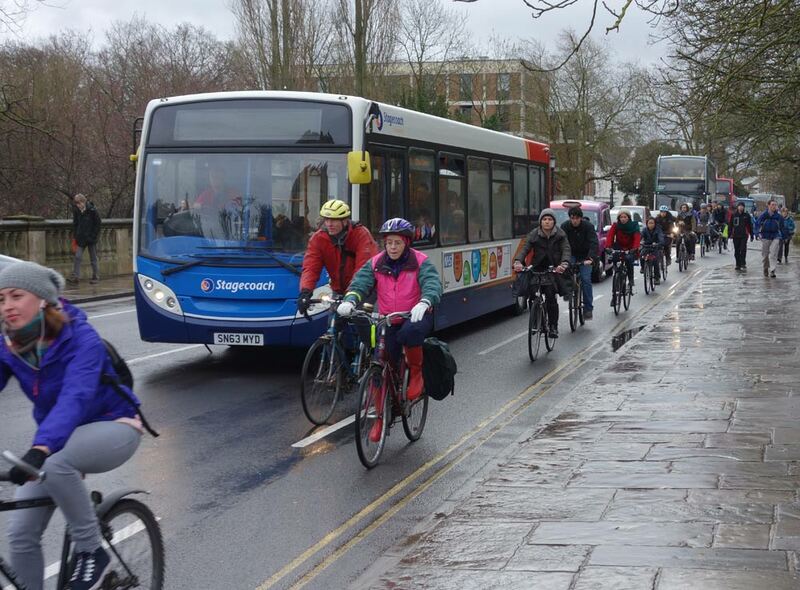 No one likes sitting in a traffic jam, cycle lanes help avoid the worst of the congestion. There are both internal costs (to driver) plus external costs to other road users and society. The CBI estimate that traffic congestion costs the UK economy £20 billion a year. (link) Other estimates of the costs of congestion widely significantly, but you don’t need to be an economist to realise traffic jams going nowhere are an inefficient use of resources. The big concern is that congestion is expected to increase over the next 20 years, due to rising population and increased use of cars. 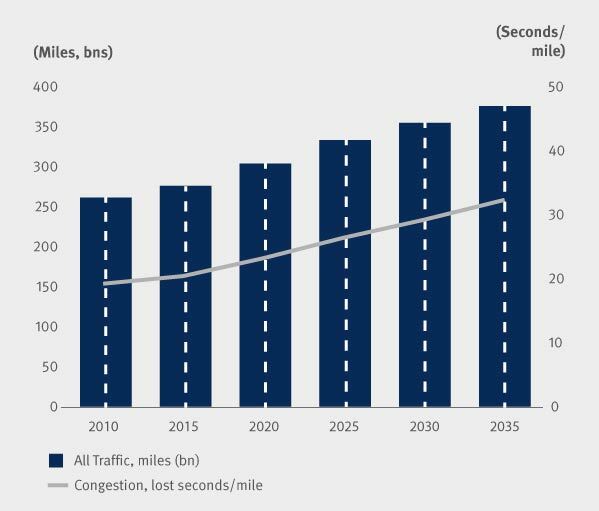 In 2010, an estimated 19 seconds per mile were lost due to congestion. By 2035, this is estimated to rise to 32 seconds per mile. This is a 68% increase in congestion from today’s levels. 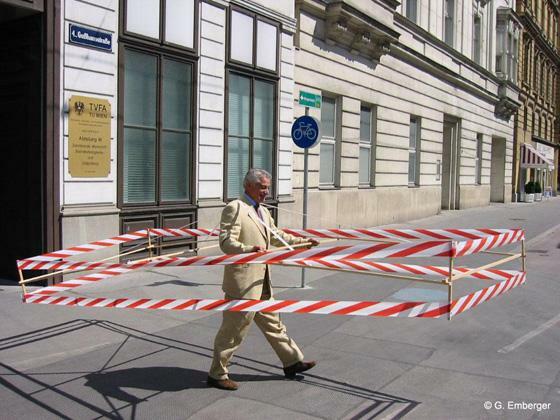 A random selection of 10 things that can make life difficult for cycling on the roads. Last Saturday, I was feeling in a good mood, so pulled over to let a van drive on a narrow road passed many parked cars. He was driving on wrong side of road, but, sometimes it’s good to give way. After waiting for him to pass down the wrong side of the road, I looked into the van to see if he might acknowledge my action. I’m not desperate for thanks, but a brief wave is a nice gesture. Alas, the driver was completely oblivious of my presence on the road, being more interested in his mobile phone call. It’s probably a good job I did wait on the pavement as he had no concentration on the road. Another thing that annoy me is when a car overtakes you and then turns left (or slams on the brakes going down hill) You have to be pretty alert for things like that. Bicycle brakes are not always as powerful as advanced car brakes. This cycle path could easily be continued straight on. Instead you’re force onto a road with cars coming off a dual carriageway roundabout at over 30mph. 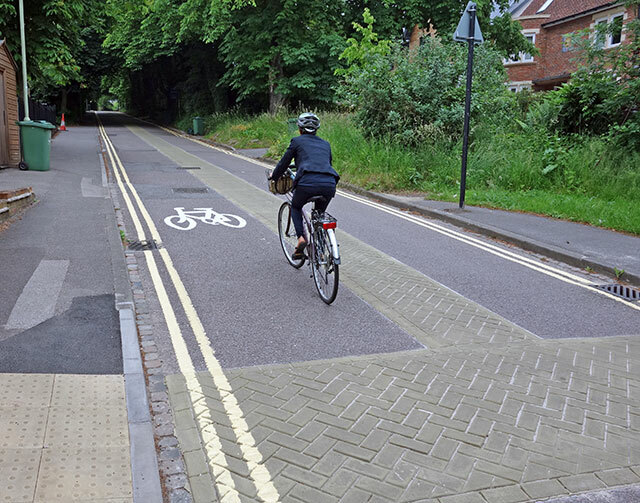 Integrated transport is a buzzword rarely applied to British cycle paths. 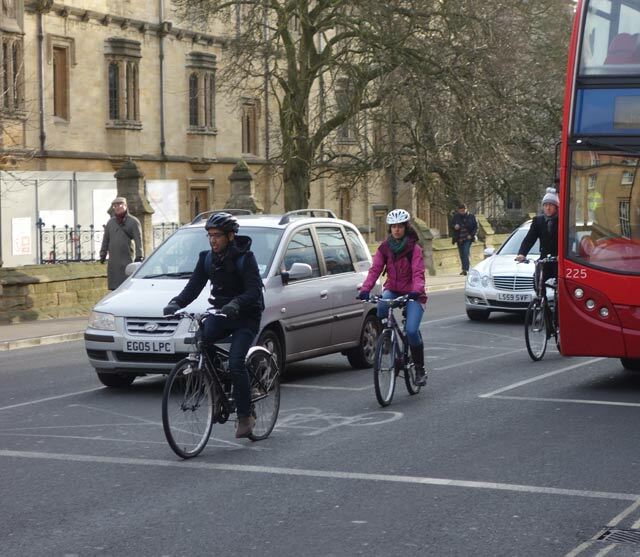 I’m impressed at the patience of these Oxford cyclists in rush hour. Who says the British can’t still queue? I have to admit I would have a temptation to sprint along the inside and then sprint away from the lights. But, when everyone is so well behaved it wouldn’t feel right to spoil the good natured patience. 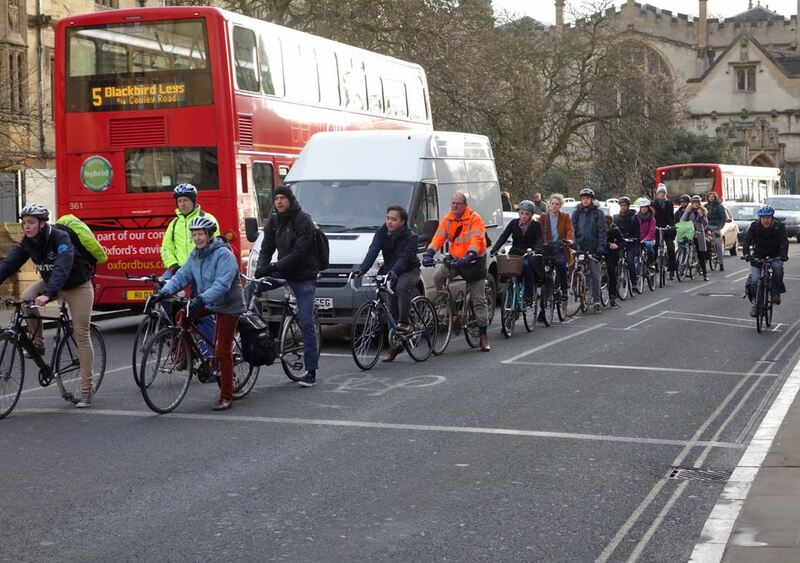 I tend to avoid the ‘cycling queue’ by going straight on and turning right later on. Definitely, when you see people acting courteously it influences other people to do the same. Similarly when some start flouting the laws it has a big influence on other people. Right hand lane waiting for lights to change. Left hand lane is straight on up the high street. 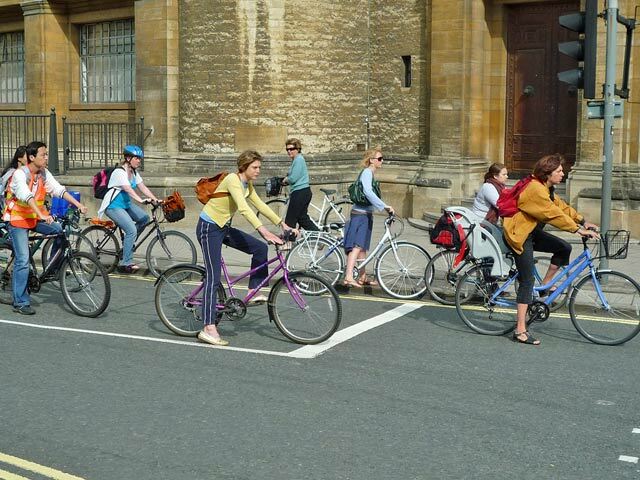 I have been reliably informed that if there is any discussion of cycling on internet, it is inevitable that, some poster (or several) will bring the conversation around to the stock comment – that cyclists use the pavement and are a real nuisance. It can be about any topic related to transport, such as improving road safety, the dangers of using mobile phones. 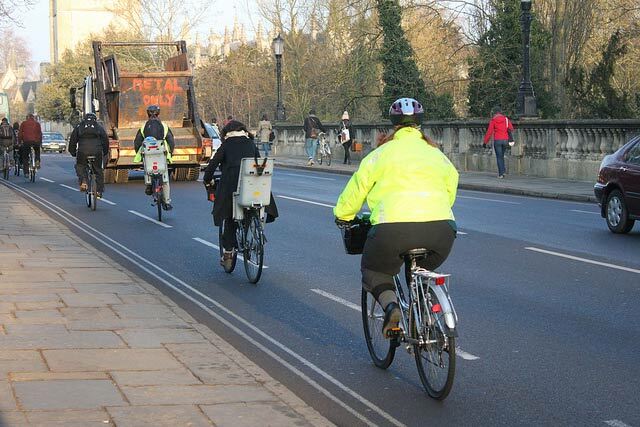 But, the fact that some cyclists use the pavement is used ad nauseam – as a sweeping statement to tarnish all cyclists and negate any sensible discussion. I’m sure that somewhere in the Bacchanalian depths of the Daily Mail comment section there is the logic that since some teenagers cycle aggressively on the pavement we should ban all cycling on the road. I have no idea why the guy on a foldup is using the pavement. There’s hardly any traffic on this road. This includes children. 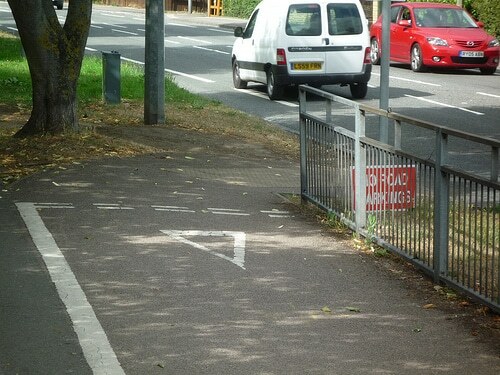 Children are not allowed to cycle on the pavement. Though the police are generally advised to use their discretion and not prosecute in this instance. 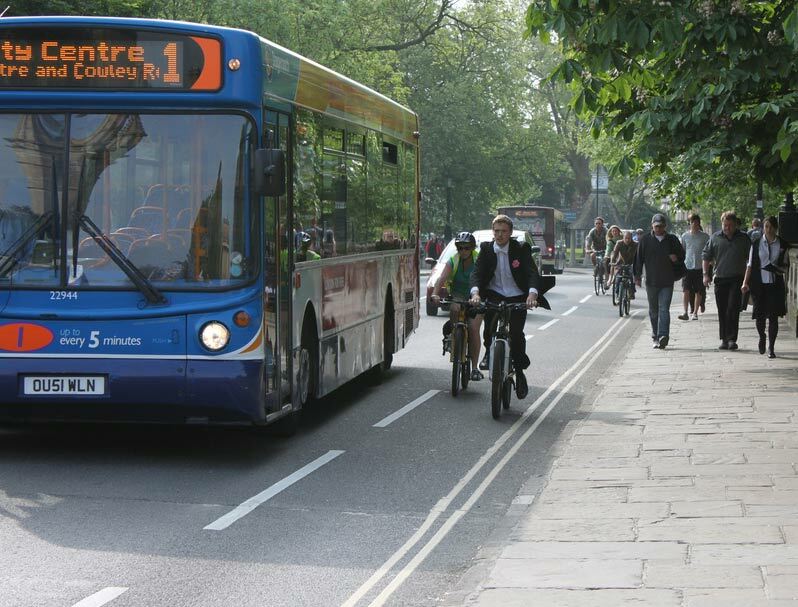 Why do people cycle on the pavement? Safety. 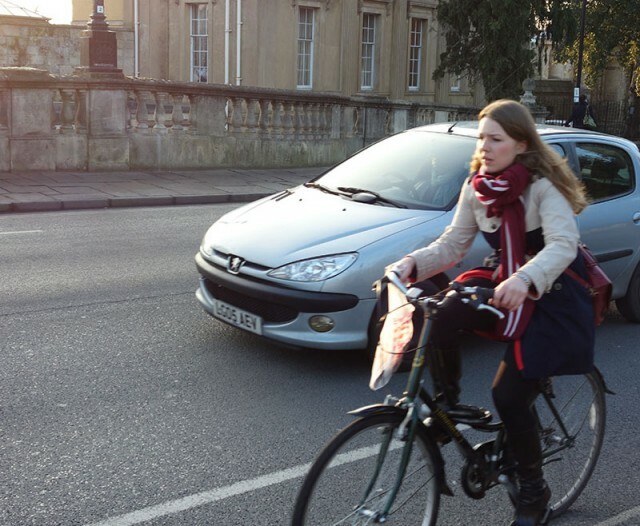 Many roads and junctions are dangerous to cycle on. 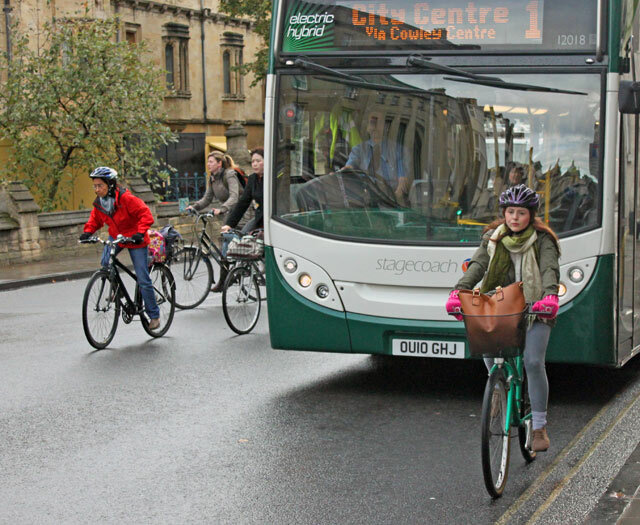 Cycling on the pavement can be a way to make a journey safer for the cyclist and avoid dangerous roads / junctions. Ignorance of the law. A study by researchers at Lancaster University found many people (especially children) were not aware that cycling on the pavement is illegal. Laziness / impatience. Sometimes you see people cycling on the pavement because they want to get their quicker and are too impatient to wait at a light or they see the pavement as a short-cut. This motive may be mixed in with the first motive about safety. Also, you get the impression with some road users that they just don’t care if they inconvenience other people. Cycling on the pavement is one of the most frequently raised local issues to the police. 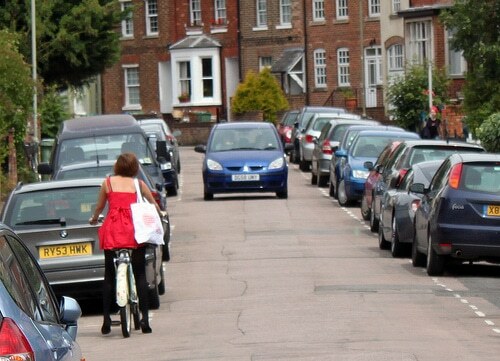 Many people really dislike having the pavement space threatened by fast moving cyclists. Even if there is no accident, old people can feel uncomfortable when a bicycle passes by at close speed. Accidents. Accidents can happen when fast moving cyclists collide with pedestrians. In rare cases it can be fatal or lead to serious injury. Very roughly, on average one pedestrian is killed by a cyclist per year. It creates ill feeling towards other cyclists. When a drunk driver kills a pedestrian because he is speeding and loses control, we don’t go around hating other drivers. 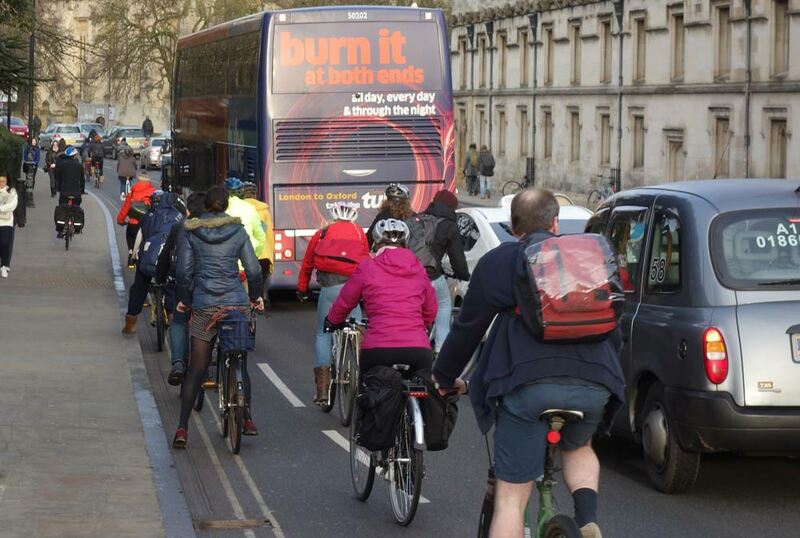 But, it does happen with cycling on pavements and it is a problem because it exacerbates tension between different road users and makes non-cyclists less sympathetic to any cyclists. In terms of fatalities and serious injuries, it seems that the threat posed by cyclists is exaggerated. 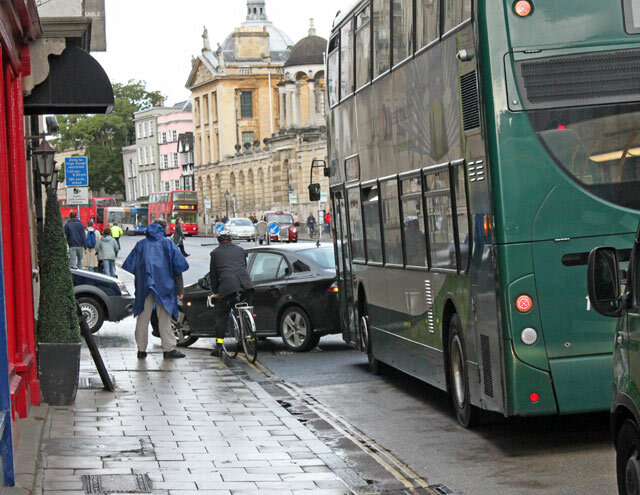 Pedestrian and motorists are quick to complain about nuisance cyclists, but it is motor vehicles which are responsible for the vast majority of serious accidents. In 2011, there were 480 pedestrian fatalities. (cycle stats) These were not caused by cyclists on the pavement. It’s not just cyclists which invade pedestrian areas, but also parked cars and cars which lose control. One thing about being a British road user is that it teaches you patience. Well, it’s either you learn to be patient, or you become really quite angry and irritable. I was dropping my bike off at Beeline this morning to re-fit a power meter. It took a long time to drive the one mile during rush hour; it’s so much slower than cycling. I realised now why I never drive in Oxford, unless I can avoid it. It takes considerable patience to drive the one mile down Cowley Road. The problem is that most of the roads around here were not designed for two rows of parked cars and heavy traffic. They were designed in the halycon days of the 1930s, when everything was in black and white and people couldn’t afford a motor car. The good old 1930s. Workers leaving factory. 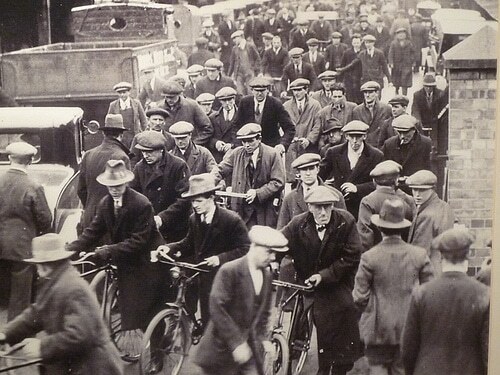 What happened when all these workers bought a motor car? But, if you start off with the mindset of being patient and expecting it to be slow, it’s much easier to retain some equanimity. If you can’t enjoy the drive into town, and least at doesn’t leave you agitated. Commuting by bike has several advantages, it can save money, get you there quicker, plus give a useful bit of exercise. 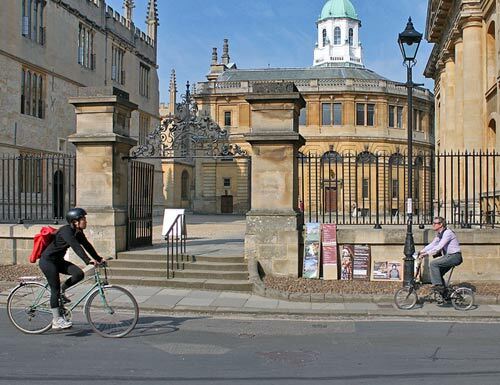 I’ve been commuting into Oxford for the past 13 years. It’s not a long commute – only about 2.5 miles each way. 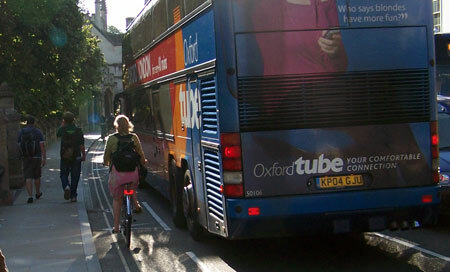 Despite the stress of dodging Oxford buses and taxis, commuting by bike is a great way to start the day. Even when I started working from home, I found in practise I preferred to keep commuting into a city centre cafe – rather than stay at home. More than anything a 10 minute cycle ride is a great way to get the brain working. Over the past 13 years, the main change I’ve noticed is that I’ve become a slightly slower and more patient commuter, but as a result probably enjoy the experience more. These are my top tips for commuting by bike. 1. Patience. Depending on the city, commuting by bike is likely to be significant faster than most other forms of transport. To a large extent, you can escape the traffic congestion and queues of traffic. However, it is not a race, if you have a little patience, you can make the ride less stressful and safer. Running red lights is dangerous and can end up leaving you with a fine. 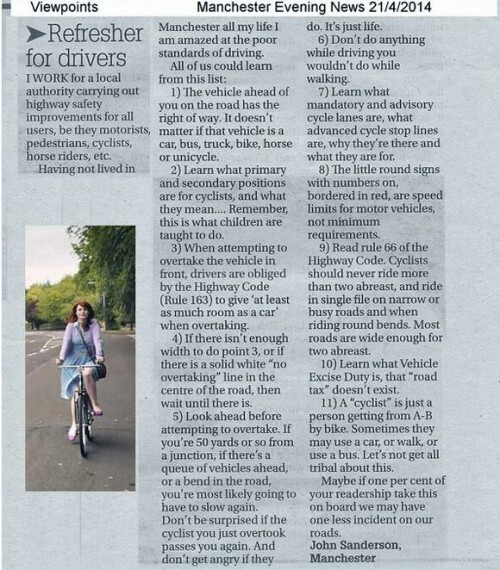 You will also annoy a lot of people – both motorists and other cyclists. If you give yourself a little more time, you won’t feel the need to push on regardless. Similarly, if you have a little patience, you won’t take unnecessary risks like squeezing inside buses to save a few seconds. It’s potentially very dangerous. Having a little patience also make the commute more enjoyable. If you treat the commute like a time trial, you are creating unnecessary stress, and you will probably end up riding like an idiot. I’ve nothing against cycling fast, but doing it up the High Street with buses and innumerable traffic lights, is not the best of places. Any commute can be made a little safer and more enjoyable by seeking out quieter roads and better journeys. If there is a nasty section of road or junction, investigate whether it is worth a detour. Planning alternative routes may add a little to your journey distance, but if it makes it safer and less stressful, it is worth it. In an ideal world, cyclists wouldn’t have to dress up like a Christmas tree to be seen. I’m not a fluorescent yellow evangelist, but it does worry me when I see cyclists wearing only dark clothes at night without lights. If you ride on the road without lights and in dark clothing, it really increases the risk of an accident. Also it annoys other road users. 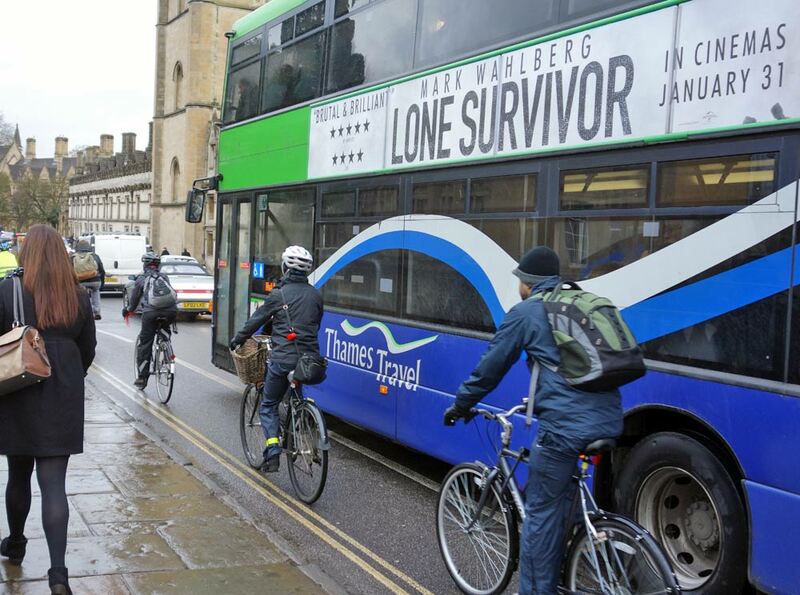 If you spend any time driving, you will understand the importance of cyclists being visible. In any commute, you will come across irritating and inconsiderate behaviour. This will be from any road user, be it pedestrian / car / bus / lorry driver / cyclist. You can not influence how other road users behave. But, the best thing is always to be considerate yourself. If you are considerate and use your common sense, you won’t get into needless dispute, but find it is quite easy to obey the highway code. Unfortunately, being a considerate road user doesn’t insulate you from all problems. If you commute anywhere in the world, you will face dangerous moments, which are out of your control. It is easier said than done, but there is a lot to be said for keeping calm and not getting drawn into arguments you can’t really win. My general philosophy is generally to have low expectations and let little irritations go. Of course, it is different if you are involved in an accident. In that case, you should take down all the details you can. But, I never expect the advanced cycle boxes to be free. I expect cars to turn into the road, making you slow down. I’m half expecting cars to be on the wrong side of the road. This is all the downside of commuting into town. But, it’s a lot easier to accept as long as you don’t feel it is your responsibility to educate all the car drivers in your city because you won’t be able to! – Avoid undertaking buses and lorries – unless you are very certain they are going to be stationary. A week last Friday, I spent all day on my back, only struggling to the bathroom with the greatest difficulty. It’s not the most fun way to spend a day, and you do start to fear how long this incapacity might last. But, fortunately the muscle seems to be healing quite well. After a few days of going crazy staying inside watching the ‘best’ of Christmas TV on BBC iPlayer, I was relieved to be able to get out of the house. This time, of course, taking very great care stepping out of the front door. Didn’t want to go rolling into the rose bushes for a 3rd fall of the week. Those kind of things are only funny when you watch them happening to other people on Youtube. Quite slowly and carefully, I was able to cycle into town. It’s only 3 km or so, but it feels quite satisfying after just a few days of inaction. My Portugal experience has been rather clouded by getting knocked off bike at 50km/h by rabid / crazy dog. 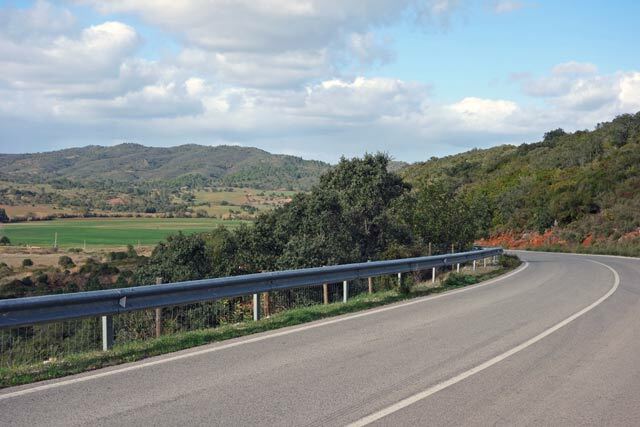 But, the simple commute into Oxford did have me nostalgically looking back to those very quiet and wide roads of the Algarve. I soon forgave Portugal all its crazy dogs after being reminded of what it’s like to cycle around Oxford. 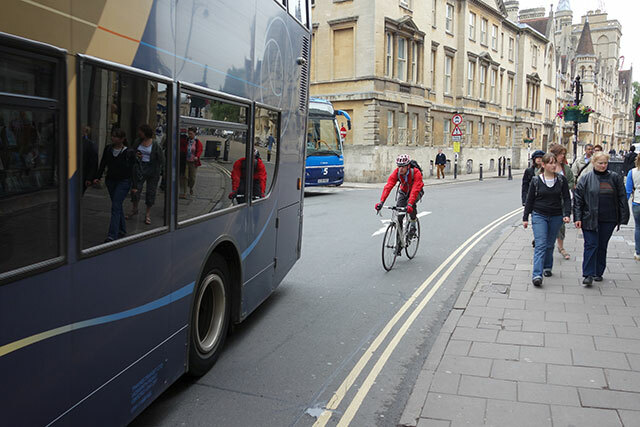 There may be no dogs in Oxford, but I got passed (closely) by more double decker buses in 5 minutes of cycling around Oxford than I did in two weeks of ‘idyllic’ cycling around Portugal.